Expats learn arts Sookmyung Women's University. Learning the most scientific phonetic language in existence to attain the ability to communicate well in Korea does not have to be so difficult, because I aspired to express myself beyond speaking louder, slower, or continuing to mime out my expressions and requests. 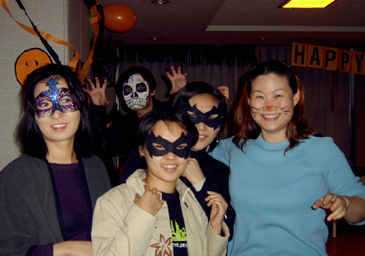 I attended several Korean language programs. The type of program I desired needed to be convenient to attend, professionally taught, and provide good cultural insights of Korea and its people. The LinguaExpress located at Sookmyung Women's University (SWU) in Seoul exceeded my expectations. Located in Yongsan-Gu, Sookmyung Women's University is accessible by public transportation. I currently attend the Regular Intensive Program beginning at ten in the morning and lasting until one in the afternoon, Monday through Friday. I appreciate the class hours because they avoid the rush hours of cars entering the university and bypass the onslaught of noisy lunch hour crowds. Entering the first floor lobby of the Social Education Building for the first time, I was impressed with the bright and comfortable space of LinguaExpress. The open lobby is flanked by large glass windows allowing the sun's rays to flow in. Many table settings and sofas make this area an excellent location to relax. With a snack from the coffee corner, students exchange conversations, watch the large screen television, or practice their new language skills. Additionally, on each floor of LinguaExpress there are supplementary tables and chairs next to wide windows offering a good view of Seoul. I appreciate the computer terminals located. I check my e-mails before and during my class breaks. On the second floor, the roomy and modern multimedia library has great individual workstations to practice language proficiency. The library services are open daily at 7:30 a.m. and close at 9:00 p.m. Students utilize the audio and video materials quickly with assistance from courteous media library staff. LinguaExpress's professional teaching staff instructs a wide variety of nationalities the Korean language by integrating listening, speaking and writing skills in relaxed and functional classrooms. Utilizing modern and updated textbooks, music, movies, and diverse dialogues to introduce a variety of everyday situations, so learning Korean is easier to understand and retain. I appreciate my instructors approach to teaching, initially my poor vocabulary and limited ability to communicate made me shy to speak Korean. Under my teachers patient guidance, I am able to say more complex sentences. I respond more effectively to questions and engage in conversations. My progressive ability to communicate in Korean is assisted by learning more about Korea's culture through the Special Program Workshops hosted by the LinguaExpress. Various Korean language programs offer field trips to various sites within Korea, however, SWU's LinguaExpress promotes hands on workshops that are informative, occasionally messy, but always enjoyable. The Kimchi 김치 Making Workshop gave all who participated a deeper appreciation of the time and effort it takes to prepare a complicated and delicious dish. Using a recipe handed down from generation to generation. Students blend vegetables, pickled fish and spices to wrap Chinese Cabbage to produce Kimchi. Besides preparing Kimchi, my class group cooked Chap Chae 잡채, Pulgoki 불고기, Pachon 파전, Kamchachon 감자전, and Kimchichon 김치전. 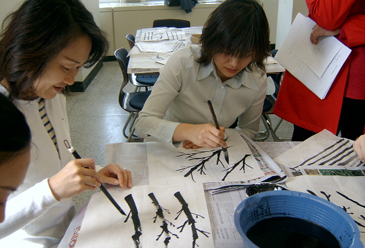 Expats learn ink painting at Sookmyung Women's University. The Korean Paper Craft Workshop introduced an artist's skill to manipulate paper to create umbrellas, rain hats, or fans in a traditional manner. Because of our novice student status, we created paper boxes by pasting layers of paper on a prefabricated framework. Being slightly prejudice, my creation was the most artistic. The quality of my studies and special workshops at SWU's LinguaExpress are excellent. 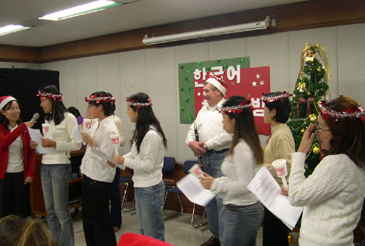 The facilities used and the professionalism of the instructors make learning Korean enjoyable. Everyone from the friendly housekeeping staff, to the cheerful and beautiful clerical staff with whom I chatted and practice my new skills, continue to encourage and ease my frustrations. Jim Henson, creator of the Muppets, once stated, "The only way the magic works is by hard work. But hard work can be fun." 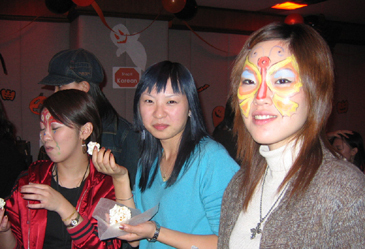 The LinguaExpress's Korean Language programs consisting of it's professional staff and special workshops makes the work of learning the Korean language easy and fun. It is magic!